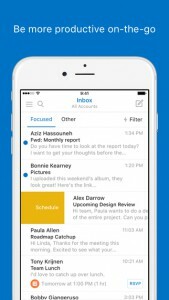 Dropbox recently announced that it will be pulling the plug on its previously popular email app, Mailbox. The app will officially go offline on February 26, 2016. While it may not seem all that unique now, Mailbox burst onto the app scene with two intriguing novelties that attracted early adopters by the droves. Mailbox became one of the first and most memorable apps to utilize a scarcity to model by motivating nearly a million anxious users to sign up and wait-sometimes for weeks-on a waitlist prior to use. Second, Mailbox was one of the first of its kind to manage emails from a task-based approach and allow users to pause an email-achieving momentary inbox peace to revisit the task at a later, pre-determined point. Users also appreciated that emails and tasks could be fast forwarded to time points that make sense to our everyday life (i.e. this weekend or next week) versus the standard data/time schedule. In foretelling his future, Mailbox developer seemed to predict that many would follow the footsteps of Mailbox in his Mashable interview. 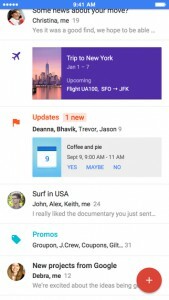 Inbox is an email app from Google. It offers more features than Gmail and streamlines the categorization of emails so users can read similar emails in batches instead of spread out throughout their inbox. The minimalistic graphics add a nice visual representation of email labels, which include calendar updates, travel plans, and promotions. Similar to Mailbox, users can snooze an email and determine what time would be more convenient for them to see it again. 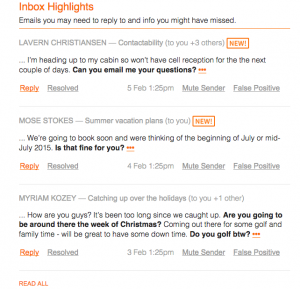 Inbox has benefited from frequent updates and offers the stability and responsiveness of the Google team. For users who were excited about the innovation behind early concepts of Mailbox, MailTime might offer that same new app feeling. 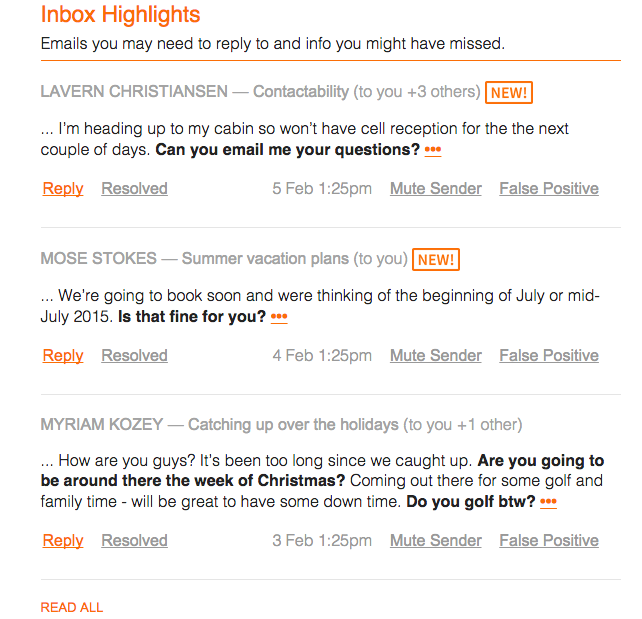 MailTime changes the way emails are displayed to an interface we’re all familiar with: text messaging. If you’ve ever sent or replied to a text, the learning curve will be minimal. By simplifying reading and responding to emails, MailTime developers think you’ll see inbox zero quicker and more often. The MailTime app includes other features that might be most comfortable for Twitter users. Tasks can be assigned within the app by using the @ sign. The app will also send a warning if your message is too long. It aims to promote frequent, quick communication rather than languishing long (and often overdue) replies. It may come as a surprise that the Outlook app, by Microsoft, could meet the needs of users who flocked to Mailbox for its unique features and intuitive interface. Outlook has enjoyed multiple makeovers. Many users report that its sorting feature works more effectively than Gmail’s Priority Inbox. Swipe gestures let users move through their inbox quickly and you can easily integrate calendars and files across multiple apps and platforms. Outlook’s ability to collaborate across apps by grouping emails according to file or sender outperforms Mailbox in many ways. Perhaps the most surprising result of this email app search was the realization that maybe there’s a strong case for using more than one app to manage communication. InboxVudu offers a number of features that are unlike any other mail management system. Most remarkably, it pulls out the most important parts of lengthy messages to let you read what’s most important. In my tests, it seems to do an accurate job of recognizing questions, event times/dates, and requests for action. Even if you prefer a more versatile or different interface for your day-to-day management, definitely consider InboxVudu as a supplement for it’s one-of-a-kind functionality. As Mailbox nears its end, change can be hard but there are more powerful email apps available than ever before. 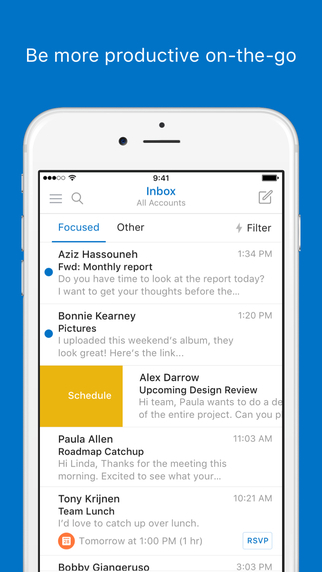 Let us know if you’ve found an email app you can’t live without.